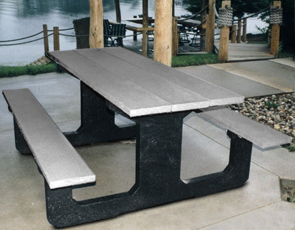 Made of 100% recycled plastic top and seat planks, and a galvanized steel understructure for added strength and support. 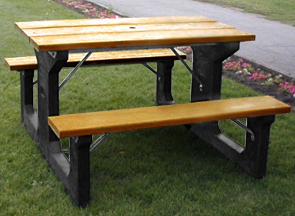 Strength and stability are hallmarks of this line of well built recycled plastic picnic tables. The walk-thru design provides comfortable easy access - great for those heavy use areas!